Cherry blackfly is a sap sucking aphid that over winters as an egg on both fruiting and ornamental cherries. Japanese cherries are generally unaffected. The black wingless aphids normally hatch out in April, and between May and July they settle on the underside of the leaves that have formed on the new shoot tips. They generally remain on these leaves from mid to late summer causing the leaves to curl up. 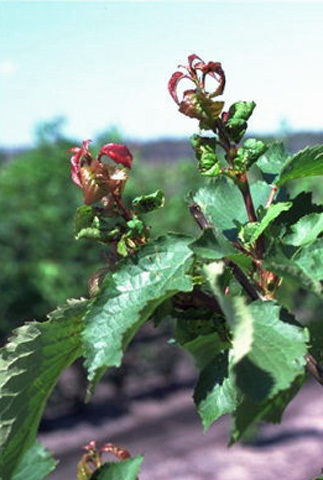 As with many sap sucking aphids they excrete sticky sugary honeydew on to the leaves and a black sooty mould often develops. This damage is more unsightly than damaging, and does not affect the fruiting varieties producing a crop. The infestation dies out when the aphid migrate in autumn when they lay their eggs near the cherries buds. Small modern trees on dwarfing rootstock can be sprayed in winter with a winter tree wash to reduce the number of over-wintering eggs. Large trees will be more difficult to treat because of access to the upper branches. Spray fruiting trees in late spring with a suitable insecticide, but do not spray when trees are in flower as this may kill off pollinators. Sprays are ineffective once leaves have curled up.